Where will the technology world head in 2015, and what technologies will people embrace? 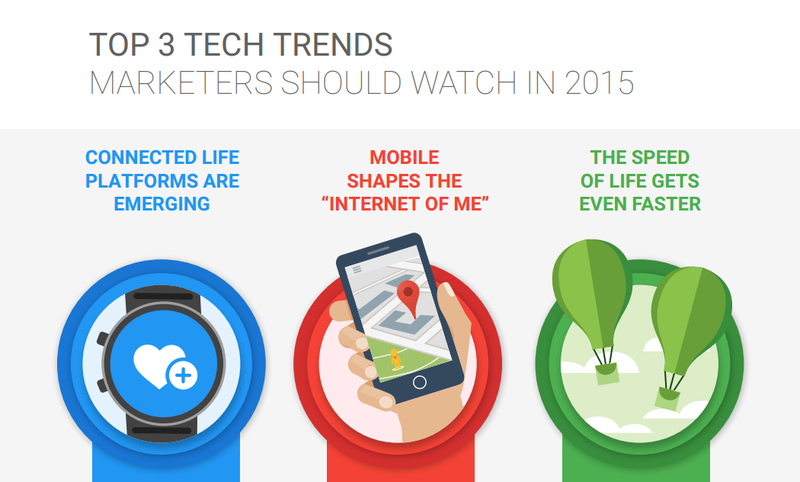 The team at ThinkWithGoogle identified 3 major trends that are likely to shape the face of technology in 2015. "Online or off, we can now get information, entertainment and services in the exact moment we want them. These quick moments of decision making happen constantly – and the more connected we are, the more they'll happen." Did you know that there are 800K hours of drone-related videos watched on YouTube in November 2014. "Consumers expect to get what they want in the moment they want it. Think about what this means for your business—24/7 customer support? On-demand delivery? A more comprehensive keyword strategy? Make interactions as fast, simple, and easy as possible and make sure they are useful in all the moments that matter." Take a look at below infographic for more insights.